Valentine's Day Diamond Jewelry Sale - Up to 50% Off! 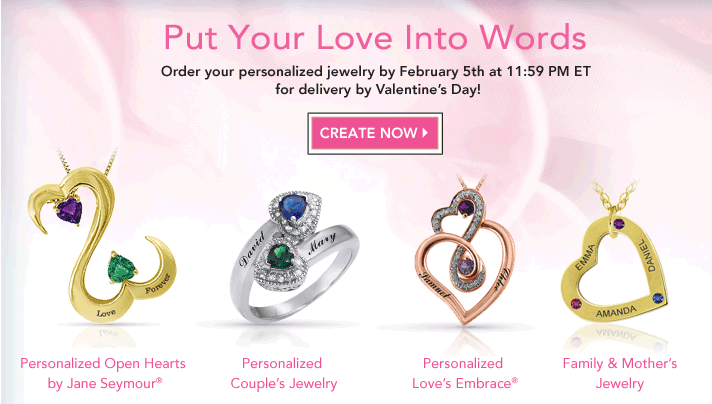 Valentine’s Day Diamond Jewelry Sale – Up to 50% Off! If you are like me, and like to do things last minute, you can still get some pretty sweet deals on diamond jewelry both online and in stores, that will not break your bank. While the deals are not as great as on Black Friday (its pretty much impossible to beat those), there is a plentiful selection of diamond earrings, studs and pendants, as well as heart shaped diamond jewelry at 40-60% off. Shapes she will love? Classic shapes such as round or princess cut studs are an all-time favorite for earrings, but more unique shapes such as hearts, knots, tear-drops, ribbons, and infinity loops are a wonderful option for pendants. Also, consider jewelry that combines diamonds with other pink/red color gemstones, such as rubies, sapphires, garnet, tourmaline and spinel. Here is a list of the HOTTEST DEALS currently going on, and don’t forget to use our Free Diamond Prices Calculator to check if you are getting the best price. The best deal going on right this minute and only until February 4th! Special Valentine’s Day diamond jewelry has been discounted as much as 80% off. Impressive discounts include such items as 1CT Diamond Solitaire Engagement Ring for $999 or a .25 CT Diamond Solitaire Pendant for $179. If you don’t make this short-lived mega sale, you can still take advantage of the discounts on diamond stud earrings. Classic round shape 14K Gold diamond studs are now on sale for $139-1,999 for 0.2-2CT stone sizes. Macy’s does not disappoint with its great selection and affordable prices on diamond and specialty Valentine jewelry. Most items are discounted at least 40% off, but there are many beautiful pieces that are now 60% off, such as 14K White Gold Diamond Stud Earrings (1 CT, t.w.) for $599 instead of $1,400. There is plenty of pieces currently on sale, so you can expect to spend between $500-1,000. If you are looking to spend $300-600 on your Valentine’s Day gift, JC Penney has a great selection of diamond jewelry at this price point. Most items range from .25 -.30 CT, and are currently discounted at about 50% off. In this prices range, there are also a number of beautiful diamond and sapphire or diamond and ruby pendants, rings and earrings. On a tight budget? You can easily get a diamond piece of jewelry at Kay, for $250-500. Also, you can make your gift extra special by personalizing it with your love’s name or a special message. Kay is currently running an online special promotion of 40% off select styles of rings, bracelets and earrings. While these prices are great, keep in mind that the diamonds you get will be fairly small, only .10-.20 CT.
For classic looks, Lord and Taylor does it best. There are many beautiful classic shape diamond studs and earrings, as well as a large selection of diamond pendants both in white and yellow gold. Most items are discounted only 10-25%. You can find some items for $500-600, but for larger size diamonds, or designer names, such as Effy or Levian, expect to spend $1,500-2,600 or more. If you are looking to pop THE QUESTION on this Valentine’s Day, you can get some sweet deals on you engagement ring at Zales. THe entire store inventory is an additional 10% off, but there are also some amazing online only deals, where engagement rings are discounted 40% off their already reasonable prices. You can spend as little as $700-1,000 for .5-1 CT diamond engagement rings.